Download and signup on embee meter vx android app and get free recharge of Rs 50. Free recharge on sign up of embee meter vx android app. Hi friends here we are sharing an free recharge trick for android users. you need only to download an app called embee meter vx. Embee meter vx is an android app that provides rewards for doing tasks. i think most of you already familiar with these type of apps. We already shared many apps that provide free recharge. Here we introduce a new app embee meter vx which provides free recharge of rs 50 at signup. This is a good offer. You just need to install and join on this app to get free recharge of rs 50. Follow below simple steps and grab your free recharge now. 5. submit the details and you get 100 more points on embee meter. 6. Now you have a total of 180 points on embee meter. 7. Now at the main menu, select your operator and enter your mobile number tp recharge. 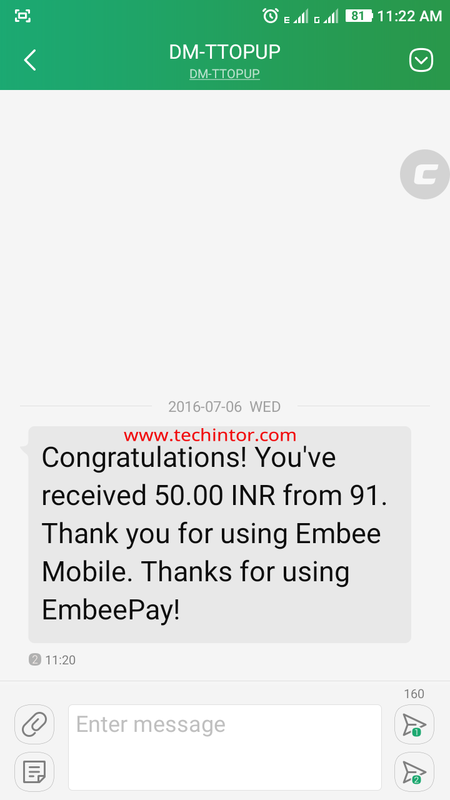 You got Rs 50 Free recharge from embee meter now. you can earn more free recharge by doing some tasks on embee meter app. Note- The free recharge will be credited on your number within 24 hours. due to huge traffic, there is some delay in recharge process. anyway, we got the free recharge of rs 50 from embee meter. personally confirmed by me. i am providing the screenshot of rs 50 free recharge here. Please share this article with your friends and help them too. also, keep visiting www.techintor.com for tricks like this. Thanks again for this wonderful trick..
welcome….. Keep visiting for more stuffs like this….. It says You are not eligible..try again later.. What can I do?